The Dao is like a vessel; we use it and it has no limit. It is deep, like the source of everything. -> Contrary to the limitation found in forms, which are bound the notions of birth and death (coming into and ceasing to be as describable existence), the Dao is beyond form and therefore has no limit. It does not have sharpness, dissolves disputes, blends brightness, and is ordinary like dust. -> Despite of its mightiness and wonder, the Dao dulls sharpness, beyond worldly disputes, blends brightness, and is ordinary like dust. It can not be seen but appears to exist. I do not know who give birth to it, it appears to exist before god. -> It can not been seen directly (as it is beyond form), but can be intuited/realized through advanced master. People like to ask the source of it, Laozi did not know, but it appears to him that it exist prior to the concept of God. This chapter describes the qualities of the Dao, as beyond form, represents the source of all things, and can be used limitlessly like a deep valley. The Dao is also described as very ordinary like dust, and does not necessary shows off its power and existence through sharpness/conflict/brightness. 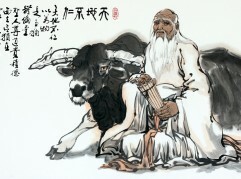 How can these qualities of the Dao been seen? Laozi said it cannot be seen directly, but could be intuited/realized subjectively. Where does the Dao comes from? If it is the source of all things, does it has a source itself? Laozi expressed it appears even prior to the concept of God. When even the concept of God does not exist, where exist the human to ask this question?